The global automotive braking system market is expected to grow significantly in coming years due to increasing safety concerns of passengers as well as drivers and formation of stricter rules by the government f various nations. Growing technological advancements that has grown the efficiency of brakes and have introduced different types of automotive brakes for automotive vehicles has also grown the demand for automotive braking system. 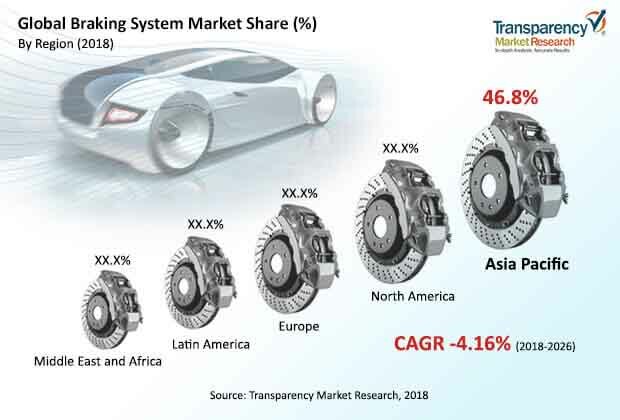 In addition, growing number of young costumers who prefer to drive high speed vehicles have also influenced manufactures to introduce and use innovative technology in the automotive braking system market globally. The global automotive braking system market is prophesied to rise at 4% of CAGR during the forecast period between 2018 and 2026. The valuation for the market is expected to reach US$107 bn by the end of 2026. The global automotive braking system market is categorized on the basis of design, brake type, sales channel, vehicles, and by region. Based on brake type the market is segmented into the drum brakes, disc brakes, and others. Of these, disc brakes are expected to have higher demand as compared to other types of brakes available in the market. The demand for disc brakes is high as it provides shorter stopping distance and is more efficient during emergency braking. In addition, these brakes require less external casing and allow cooler running. Disc brakes are also used in most of the heavy –duty trucks. Moreover, the introduction of front-disc/rear-drum setup, which can be mounted on low and medium-priced vehicles, is projected to drive the demand for the market in coming years. Based on types of vehicles, the global automotive braking system market is bifurcated into passengers and commercial vehicles. As brakes are an integral system required in every vehicles, the growing production of vehicles and its rising demand will have a direct effect on the market. For instance, demand for SUVs has grown in North America mainly for its use in off-terrain activities, thus, it has created various opportunities for the automotive braking system market in region. Moreover, the government’s investment in developing logistics and infrastructure mainly in the U.S. have increased the demand for commercial vehicles in the country. The use of automotive braking system in buses and coaches and heavy commercial vehicles due to better brake response and high efficiency. Considering these factors, the commercial vehicle segment is projected to rise during the forecast period. On the regional front, the report on the global automotive braking system market is segmented into Europe, South America, North America, Asia Pacific, and the Middle East and Africa. Among these regions, Asia Pacific is dominating as compared to the other regions in the market. Attributing to low production cost and increasing demand in countries like India and China is responsible for the dominance of this region. The growing entrance of foreign automakers and auto parts manufacturers in this region has create lucrative opportunities in this region. In addition, there is huge participation from BRICS nations in trade affairs in India and China thus, growing them significantly in the automotive braking system market. However, Europe and North America are leading the market in various other segments, adding to it, strict safety regulations and competitive dynamic of the trucking industry are expected to drive pneumatic segment in the automotive braking system in North America. The automotive braking system market has been forecasted for the period 2018 to 2026 based on revenue (US$ Mn) and volume (Million Units). This report provides forecasts and analysis of the automotive braking system market at the regional and global levels. The study highlights the market drivers and restraint influencing the market. The report also highlights opportunities in the automotive braking system market and underlines the technological roadmap for understanding the market. The report contains value chain analysis, which provides a comprehensive view of the global automotive braking system market. The Porter’s Five Forces analysis of the automotive braking system market has also been included to help understand the competitive landscape in the market. The study encompasses market attractiveness analysis, wherein end-users are benchmarked based on their market size, growth rate, and attractiveness. The study provides a decisive view of the global automotive braking system market by segmenting it in terms of design, system type, sales channel, vehicle type, and region. These segments have been analyzed based on present and future trends. Regional segmentation comprises current scenario along with forecast of the automotive braking system market. The forecast provided is based on the compilation of current trends as well as the expected scenario in future due to change in technological, geographical, political, and economic factors such as the rapid growth of the electric vehicles market. Demand for high safety among consumers and government safety regulations have been considered while sizing the market. The study includes profiles of major companies operating in the global automotive braking system market. The major share of the market is held by a few key players and the rest is fragmented between small manufacturers. Major players in the automotive braking system market are ZF Friedrichshafen AG, Brembo S.p.A., Continental AG, Robert Bosch GmbH, AISIN SEIKI, Borg Warner, WABCO, Hyundai Mobis, Hitachi Ltd., FTE Automotive, Futitsu Ten Ltd., Nissin Kogya Co., Ltd., Brakes India, Federal Mogul LLC., Haldex Group, Hella Pagid GmbH, Sumitomo Riko Company Ltd., Hutchinson SA, Nisshinbo Brake Inc., TMD Friction Holdings GmbH, MAT Holdings, Inc., ASK Automotive Pvt. Ltd., BNA Automotive India Pvt. Ltd., AC Delco, Meritor, Inc., Mando Corporation, Knorr Bremse AG, ADVICS CO., LTD., and EXEDY Corporation. Market players have been profiled in terms of attributes such as company overview, financial overview, business strategies, and recent developments. The automotive braking system market is primarily driven by increaseasing demand of occupant safety and high speed vehicles. Being an integral safety equipment preventing collisions, the technological advancements in design and systems have propelled the braking system market. The report provides the estimated market size of the automotive braking system market for 2017 and forecast for the next nine years. The global market size has been provided in terms of revenue (US$ Mn) and volume (Million Units). Market figures have been estimated based on design, system type, sales channel, vehicle type, and regions. Size and forecast for each major segment have been provided in terms of global and regional/country markets. In-depth interviews and discussions were conducted with a number of key industry participants and opinion from leaders to compile the research report. Primary research represents the bulk of research efforts, supplemented by extensive secondary research. Key players’ product literature, annual reports, press releases, and relevant documents were reviewed for competitive analysis and market understanding. Secondary research also includes a search of recent trade, technical writing, Internet sources, and statistical data from government websites, trade associations, and agencies. This has proven to be the most reliable, effective, and successful approach for obtaining precise market data, capturing industry participants’ insights, and recognizing business opportunities. Secondary research sources that are typically referred to include, but are not limited to company websites, annual reports, financial reports, broker reports, investor presentations, and SEC filings, internal and external proprietary databases, and relevant patent and regulatory databases, national government documents, statistical databases, market reports, news articles, press releases, and webcasts specific to companies operating in the market, American Automobile Association, European Automobile Manufacturers Association, Automotive Research Association of India, Organisation Internationale des Constructeurs d'Automobile (OICA), Factiva, etc.